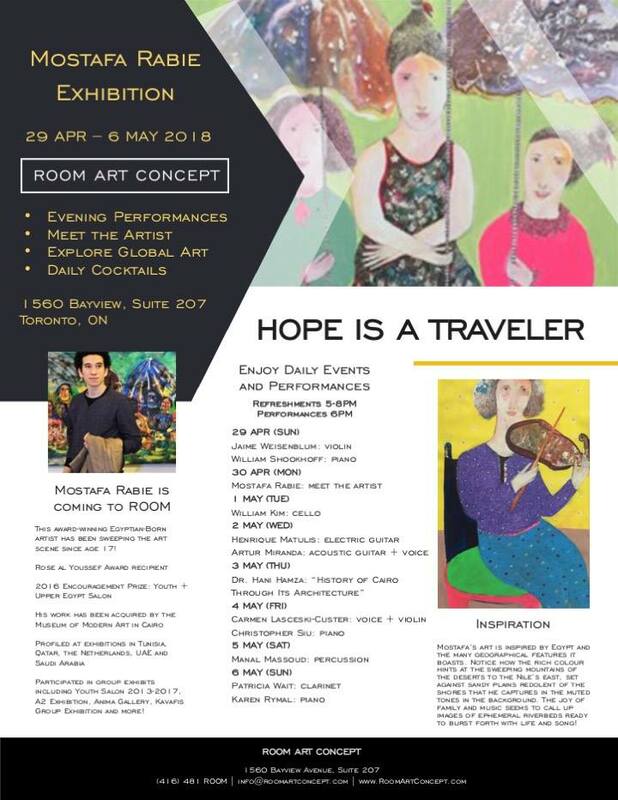 I am both excited and honoured to be teaming up once again with pianist, Christopher Siu to play a half-hour set split between violin and voice on Friday, May 4th at 6pm at ROOM Art Concept's week long solo exhibition, Hope Is Traveler, by Egyptian artist, Mostafa Rabe. As part of the exhibition, all this week, ROOM will be holding nightly events featuring performances by several fabulous Toronto musicians, and I feel so honoured to be part of the line up! In addition to hearing some great music at these nightly performances, you will also be able to meet the artist, as Mostafa has traveled to Toronto for the exhibit. Admission is free, so come out, have a glass of wine and enjoy an evening of art and music!